Other Webmasters will not submit any sitemap for their website/websites but if you're the kind of Webmaster who wants to receive more info about your website then you can do this because it is offered for free from Google. First of all, visit/click this link: Google Webmaster Tools and log-in. Try to look for the website that you want to add a sitemap. I have created a few websites recently and I will show you how I added a sitemap to my new website http://www.funkidscreation.com/. You need to click your website on the left side either the the picture or the URL (any of the covered ones in my examples below). 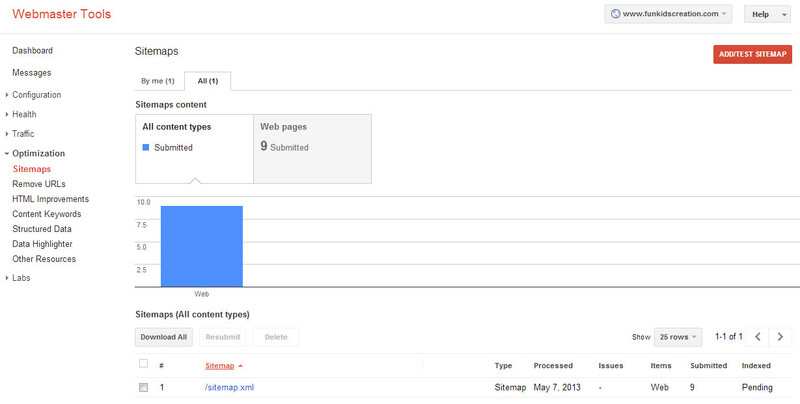 Next, click the gray button "Sitemaps No Sitemaps" on the right side of the webpage. The Yola sitemap for your published site is your own domain name, then simply followed by: /sitemap.xml. So for example your website is "http://funkidscreation.com then the URL of your sitemap for the test site would be: "http://funkidscreation.com/sitemap.xml". If you are ready to submit your Yola sitemap in the Google Webmaster Tool page, you just copy and paste /sitemap.xml on the space/rectangular box provided then the URL of your sitemap for your test site would be: "http://funkidscreation.com/sitemap.xml". On the Webmaster Dashboard page and this is simply the same page where you recently verified your domain on, you can click the "Submit Sitemap" rectangular blue colored button. After you can click the said button, congrats! You already had verified your website and submitted a Sitemap through Google Webmaster Tools. You can also try the "Add/Test Sitemap" and test if Google was able to crawl your website. In this way, you will be able to see some data that can help you optimize your website for Search Engines. I just recently added sitemaps to my newly created websites and I thought I may be able to help those who are doing the same. I'm not really good in creating websites as well as adding codes to them since I am not a professional/well trained but I just hope that I was able to help a little. If ever I had an error in this webpage, kindly comment so that I can correct any, thanks in advance. Happy Holidays Sale: Get 25% Off 1 year Yola Silver! Use code 25HAPPY. Offer ends 12/16 - Start building a business website today! You can also learn more on why you should submit a sitemap, simply click here for more information: About Sitemaps. When you just recently have added your website to Google's Webmaster Tools, you may not able to see any available data yet just like my newly created website http://www.funkidscreation.com/. The reason for this according to Google is that it may take some time before diagnostic and other data is available but this is normal since it can take some time for Webmaster Tools to gather and process data for your website. Google had suggested in general that if you see a "No data yet" message, you can check back later. Once Google starts crawling your site more often, you'll notice that Webmaster Tools will begin to show more detailed data, and that this data is updated more often.